It was while I was napping one Sunday afternoon that my colleague VM came up to me and inquired if I might review a book of Dog Stories. Who better than a dog to review such a book, he said, and I agreed. He is logical, once in a way. So, snacking on some dog food with some fine Pullao (brown rice, spinach, carrots, garlic, ginger, moong daal, milk, a touch of vinegar and other goodies) he made for me, I pawed through the pages. 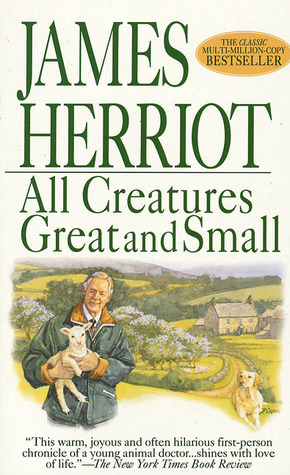 James Herriot was a Vet who wrote some fine books about his experiences dealing with animals. Many people assume that such books do not constitute serious literature. They are wrong. To be able to delve into the mind on an animal and weave entire stories is not easy at all. I myself occasionally fail to understand the peculiar behavior of my colleague VM, but on the whole, he seems tolerable and non-interfering, if slightly dull. I amuse myself by manipulating him every now and then and have a few laughs. But I digress. James Herriot’s real name was James Alfred Wight. He was born in 1916 and took up Veterinary practice in Yorkshire. His books like All Creatures Great and Small, All Things Bright and Beautiful and others made waves with their thoughtful and sensitive depiction of the joys and sorrows involved in a Veterinary practice. A big – if benign – the mistake most people make is trying to ascribe too many ‘human’ qualities to animals. Thus, you see people dressing us up and making us pose for pictures and so on. A bigger mistake – and a serious one – is not to see the dignity of life within us. We have, as such, only our lives. We cannot own property and we do not want to. But we do feel in our own way – sorrow, joy, pain, parting. We empathize. We believe in friendships. We care for our young. We communicate in our own way, very effectively. Mankind has so firmly woven a hoax of superiority that it takes a lot for them to bring themselves down to earth to say that we too have a right to this planet. Many cute books about animals are directed at children. But Herriot’s books work for the adult as well. They show the dog and the human as partners. This book has stories about all kinds of wonderful dogs who enriched the lives of their human companions in many different ways. Unlike Hugh Lofting’s books, which showed a Doctor who could communicate via a language with animals, we see here a Doctor with heightened sensitivity who could understand the problems we are unable to articulate. The writing is crisp and easy, without an overdose of sentimentality. Animal medicine is discussed in adult terms. The stories are believable and well written. My favorite was of an aloof bachelor and his dog Theo. Theo was diagnosed as having cancer and the owner acted maturely in agreeing with Dr. Herriot that death was preferable to a painful lingering death. Within days of his dog’s death, the bachelor committed suicide, unable to bear the pain of separation. Dramatic? Absurd? Perhaps to some. But only those who have had a dog as a companion know the depth of the bond between the two. My companion, VM, for instance, is always worried about my next meal – a cool fellow. On my part, I know he feels very happy just to have me stretch out near his legs. This is true for MANY dog owners, not those who tie them up and mistreat them. Another story is about a young neglected boy and his bond with a stray. The story illustrated to me a very important point – dogs can detect the true nature of an individual instantaneously. And a good indicator of how a boy will shape up can be seen in how he treats animals. The book is excellent reading for all. James Herriot may not have won the Nobel Prize, but the dog community has always held him in high esteem. One of my favourite books, Jumble. Thanks for reminding me of this series. I need to read them again. We just simply LOVE Harriot. He and Durrell are amongst our favourite ‘animal authors’. Till date, even after reading and re-reading Harriot’s stories, there hasn’t been one single instance when we have been able to read them without crying! Besides, we’ve learned so much from his details of his work. ..
Pingback: Top 6 Dog Movies that absolutely won the box office! Previous Previous post: Where’s your glass, dude?